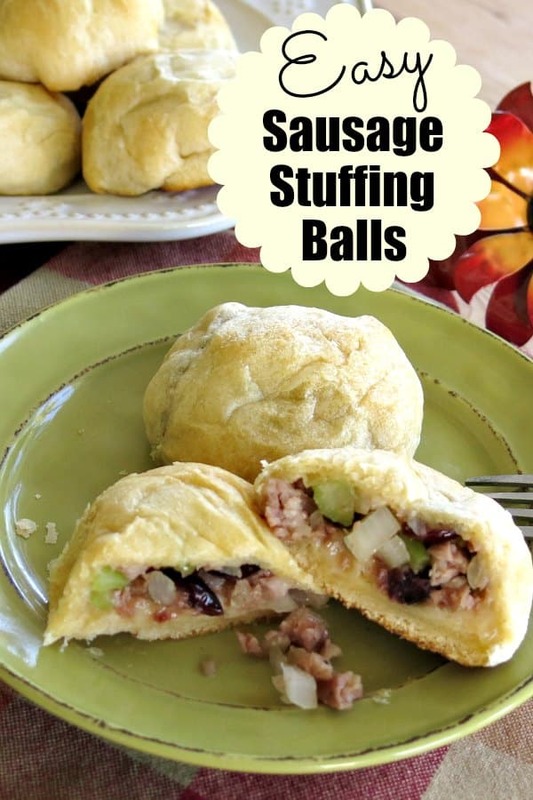 Easy Sausage Stuffing Balls hide just 6 ingredients including sausage and cranberries inside crescent roll dough in this recipe. They’re not just for holidays like Thanksgiving either. They make any meal special! I’m messing with the family recipe for stuffing again this year…in a good way…and, for good reason. I’ve made Farro Pilaf and Stuffing Muffins in years past. I tiptoe around the idea of experimenting with this staple of our holiday dinner table. Stuffing is one of those recipes that has been handed down over the years. The family entrusted with its preparation for the annual feast must make it according to the family recipe. The entire process, from making it, taste testing it, to enjoying it the day after, brings up memories of years past and loved ones. I would never replace it. 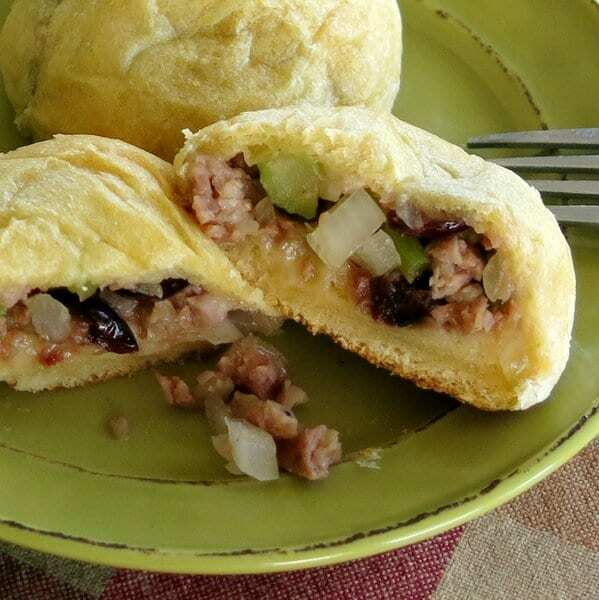 In this recipe, sausage, onion, celery, and dried cranberries are coated with apple butter and encased in crescent dough for a spectacular roll or side dish. Cooked Sausage – we used chicken apple chicken sausage; however, any cooked sausage will work. Dried Cranberries – raisins, apricots or any dried fruit can also be used. 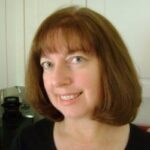 Apple Butter – Make a batch of Low-Sugar Crock-Pot Apple Butter or can buy a jar from the store. I always have a can of Pillsbury® Crescent Rolls in the refrigerator. 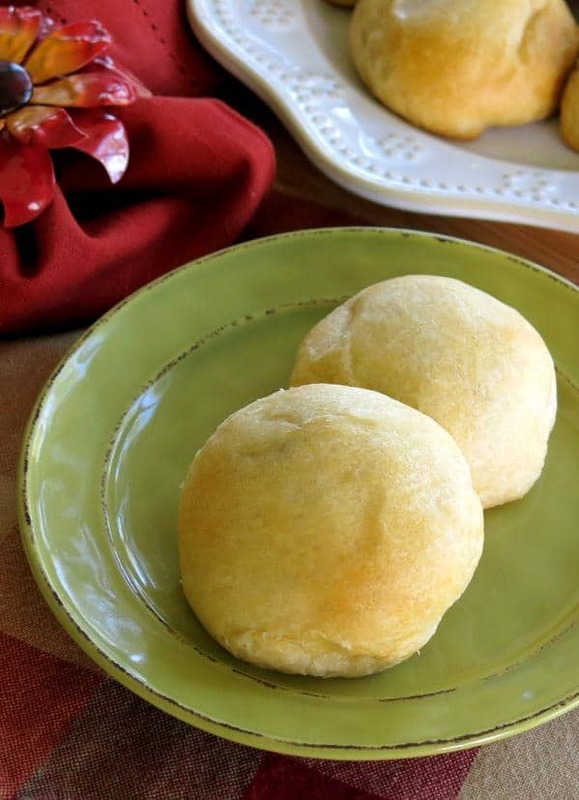 If we’re not making rolls to have with dinner, we’re making Easy Pot Pies or 3 Cheese Rosemary and Garlic Pizza Bites. No matter what I put inside, I know everyone is going to love it! Prepare sausage by cutting the link into a few large pieces and grinding it into a crumbly consistency in a food processor. Tip: Use this little trick to add protein and flavor to recipes like Cajun Dirty Rice and Stuffed Tomatoes with Rice. I’m personally a big fan of chicken sausage, but any cooked sausage will work. Soften diced celery and onions in olive oil. Stir in crumbled sausage, dried cranberries, and apple butter. Roll out the dough, press the seams together, cut the dough into squares. Mound stuffing mixture in the center of each square. Pull up the sides and roll into balls. Place seam side down on a baking sheet and cook until browned. It takes about 10 minutes in a 350ºF oven. Easy Sausage Stuffing Balls have just 6 ingredients and are ready in under 30 minutes. You're minutes away from adding something special to your next meal! Add olive oil to pan and swirl to coat. Add onion and celery to pan and saute for about 5 minutes or until softened. Combine onion, celery, sausage, cranberries and apple butter in a bowl. 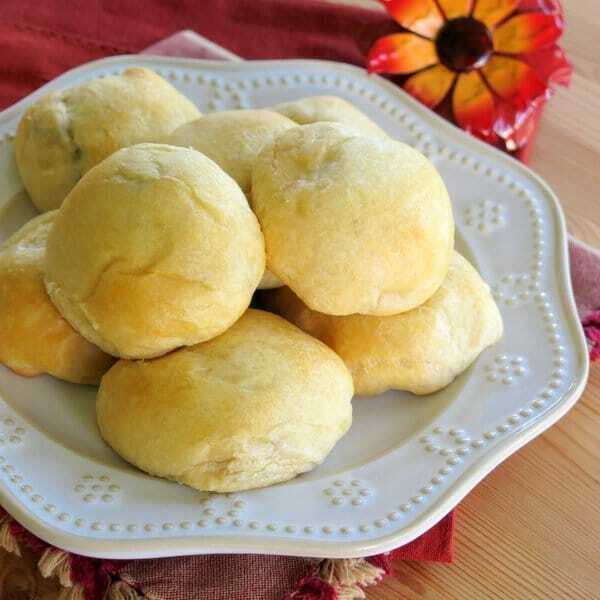 Roll out dough on a flat surface and press seams together. 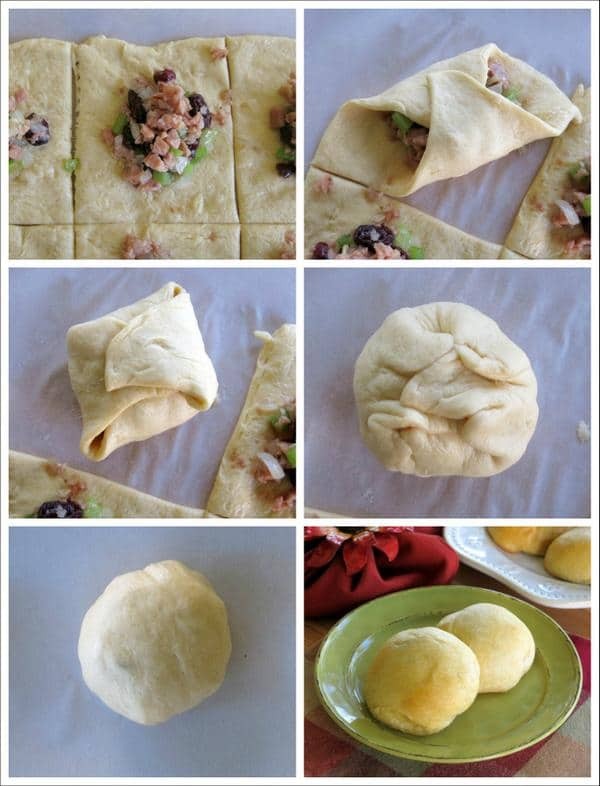 Pull up the sides of the dough over the stuffing mixture and roll into a ball. Place seam side down on a baking sheet lined with parchment paper. Bake for 9-12 minutes or until lightly browned. So delicious! I make a similar recipe with chicken that I like, but I love the sausage in these!